What a difference a day makes. After an enforced rest day in Robe because of crazy high winds (in the wrong direction), we awoke to a gorgeous sunny day with fairly mild winds and perfect mid twenty temperatures. We had a fairly short cycling day planned to Beachport (~50km) so there was no hurry to get on the bikes. When we finally set out we found ourselves on good roads with a reasonable shoulder and whilst the traffic was busy, it wasn’t hectic. Once we turned off to Beachport at the Penola turn off, the traffic thinned out even further and we had an awesome ride into town (almost). About a km out we picked up a bike path. How good could it get? Not much better it seemed. The views of the ocean and onto the small beach front town were gorgeous. THEN, about 500m from the caravan park, the Bicycle Gods decided we’d had it far too easy. My back tyre exploded with a load bang that had my heart pounding and the adrenalin flowing. For a split second I thought we’d been shot at!! It was a complete blowout, not just a puncture so it was off the bike and then walking for the last little bit. I guess we were really lucky it hadn’t happened sooner. Ironic that it had occurred on a bike path rather than the 4500km of roads, with sometimes atrocious shoulders, we’d travelled over the past few months. We carry a spare tyre of course so it was short work to get it changed over to a brand new Schwalbe Marathon plus. My continental had a nasty double slash that had penetrated the inner wall so I threw it away. 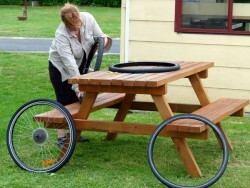 We had two days riding to Mt Gambier but surely we’d make it there before we needed another spare. Hmmmm. Beachport is a lovely little place. 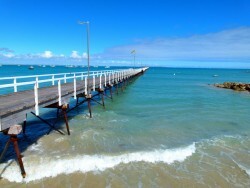 The beach and pier are even nicer than Robe and there’s plenty of facilities for the average holiday maker that wants to relax by the sea. The pub’s pretty nice and was rocking on a Friday night. There’s have a small supermarket, at least 2 nice looking cafes, a museum, a seafood warehouse and a couple of take-aways. The views across the bay are stunning and judging by the number of fishing rods we saw, the fishing is pretty good as well. 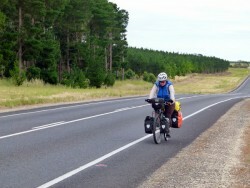 We had another short ride to our next stop, Millicent so were in no hurry the next day. We kept well away from the bike path as we headed back out the same road we came in on. I was just starting to get into the rhythm at the 8km mark when KABOOOOOOMMM!!!!! My back tyre went again. I could not believe it. 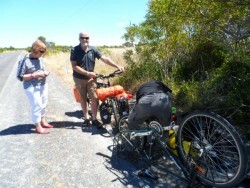 We unloaded the panniers on the side of the road and set about examining the damage. It seemed the tyre wall near the rim had been damaged as the metal protection layer was now exposed. The tube had a hole about 5mm in diameter. We weighed up our options. We could change the tube no worries but there was nothing to say it wouldn’t do exactly the same thing just down the road. A couple of German cyclists pulled up for a chat. They couldn’t help as their tyres were a different size. We had no choice but to change it over and pump it up. It was pretty obvious it wasn’t going to last long as there was a huge bulge where the defect was in the tyre wall. Just as we were contemplating what to do, a car slowed down as they passed us, turned around and came back. Tony and Pat Green from Adelaide had come to see if there was anything they could do. They are both keen cyclists and were happy to assist some fellow travelers. Unfortunately their tyres didn’t fit either, although they did give us a lovely Kevlar inner liner to boost our chances of making the next town. We finally decided that the best course of action was for them to drive me back to Beachport to try and find the old tyre which, despite the slash, was still in better condition than the Schwalbe. Luckily it was still in the bin (with a few other smelly bits…eeewwww!!!!) and we could return to swap it over. In hindsight we should have switched my good tyre on the front with the slashed one on the back but hey. You live and learn. At least we had the Kevlar liner. It’s was another lovely lesson in good Karma and the kindness of strangers we’ve met along the way. We took some piccies, traded contact details, shook hands and they went on their way. As luck would have it, despite the slash getting wider as we got closer to Millicient, the tyre held all the way. A quick look at the Samsung gave details of a sports shop in town. They didn’t have a tyre but they were able to ring the “Toy King” who were still open and had one that fitted. To cut a long story short we got a big, fat cheap tyre that we put on the front, switched the good Conti to the back and kept the slashed tyre as the spare for the trip to Mt Gambier where we picked up two brand new Schwables and now keep the good Conti as the spare. Wheww. Enough of the tyre dramas for the rest of the trip I hope. We stayed at the Lakeside Caravan Park in Millicent. Amenities are a bit older but are adequate.$20 gets you a comfortable, grassed unpowered site with access to a well equipped camp kitchen and BBQ area. A 50 m walk brings you to the biggest swimming pool in town. It’s a very large lake, very close to town, with swim lanes, pontoons, a shallow area for the littlies and rubber rafts for hire. It was the first sunny day in quite a while and the locals were loving it. Due to the tyre issues we didn’t really get to explore the town much but we can tell you it has two supermarkets at least and a couple of excellent pubs. And we shouldn’t forget the great help and advice we got from the owner of TOY KING who helped us with the tyre. The road from Millicent to Mt Gambier (via Tantanoola where you can camp behind the pub if you want) is quite busy but has a good shoulder most of the way. There’s a few hills but nothing too strenuous. Be aware that there are no coffee stops on the way and the pub at Tantanoola doesn’t open til about 11.30. We half wished we’d continued on from Millicent as a local reported that the pub had been rocking the night before and we had gotten quite partial to county pub hospitality. The weather turned a bit wild on us again for the two days we were in Mt Gambier, so once again we grabbed a cabin. 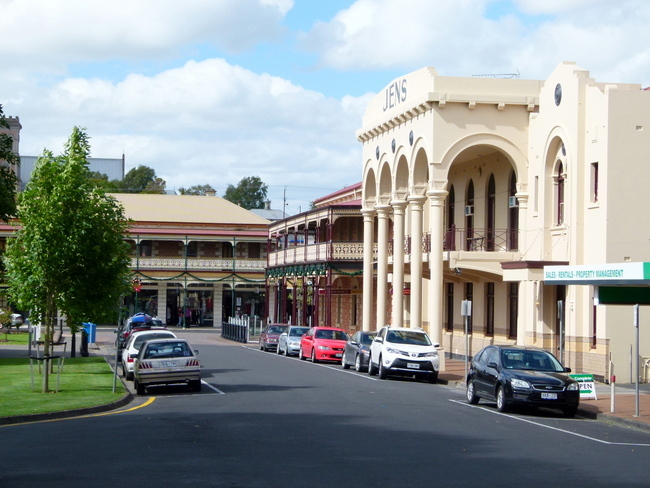 Central Caravan Park is an excellent choice if you want to explore the city and its sights. It has flat grassed sites, good facilities and an excellent location. It’s very close to a sharp ride UP!!!! 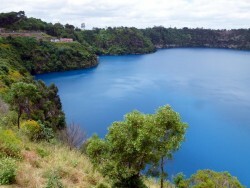 to Blue Lake for a circuit ride with spectacular views and a short walk to most of the other attractions in town. 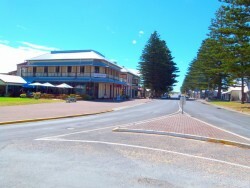 The supermarkets are a short walk from the caravan park, as are numerous take away restaurants. 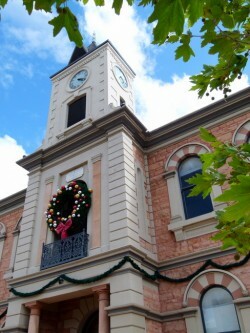 Mt Gambier has some gorgeous historical buildings, a nice shopping district that was decked out for Christmas, weekend markets and some very trendy pubs. 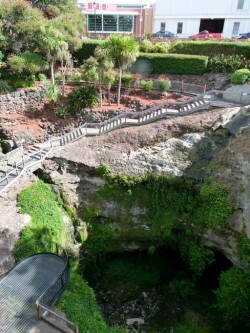 There are also caves, museums, a sound and light show and a number of other attractions you can visit. 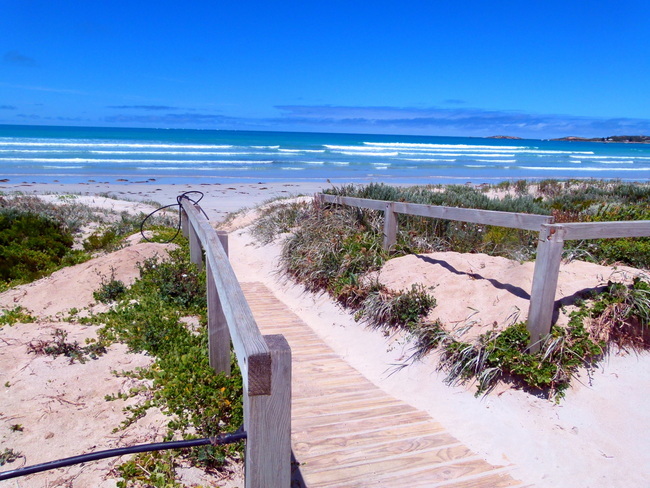 I have to say we were both very impressed with the South East of South Australia. It’s pretty easy riding once you’re over the Adelaide hills, especially if the winds were in your favour. The roads are fairly good and the little towns along the way have plenty to offer in the way of attractions, facilities and good old fashioned hospitality. If the weather had been better we may never have left but, as we learnt from the locals, it’s pretty unpredictable much of the time. You have to take the great with the not so great and just learn to deal with it. I can see a time when we’ll be whinging about the heat in the not too distant future and then having to plan around that as we head into Victoria.